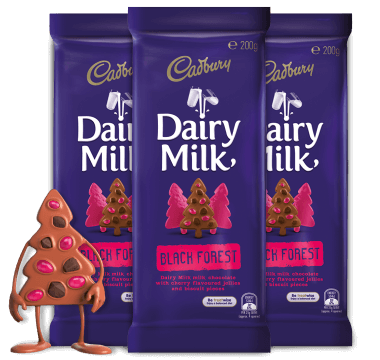 Our chocolatiers have the best job in the world making Cadbury Dairy Milk Black Forest on our chocolate rollercoaster. Racing through the factory, they roll into a loop the loop, emptying the delicious cherry flavoured jellies and biscuit pieces into our chocolate mixer. It’s the only way to make the perfect Black Forest block. Cadbury Dairy Milk Milk Chocolate With Cherry Flavoured Jellies And Biscuit Pieces. Contains milk and soy. May contain traces of wheat, egg, peanuts and tree nuts. *Percentage Daily intake are based on an average adult diet of 8700kj. Your daily intakes may be higher or lower depending on your energy needs. To learn more click here. Try searchingSearch by name or flavour.